Khartoum — President Omar Al Bashir was whisked away from the Sayida Sanhouri Mosque in Khartoum on Friday after worshippers began to chant slogans calling for him to step down. Demonstrations against Al Bashir and his regime continued for the tenth day in a row, and several prominent clerics denounced the government response to the protests in their Friday sermons. In eight states of Sudan, protesters condemned the killing of peaceful demonstrators and demanded freedom and dignity. The security forces fired in the air and used tear gas, batons, and hoses to disperse the crowds causing a number of injuries among the demonstrators. At the Sayida Sanhouri Mosque in Khartoum, where Al Bashir attended Friday prayers, one of the worshipers began shouting at him and demanded that he step down. Al Bashir was quickly escorted from the building. According to witnesses, the worshipers surrounded the protestor and protected him from Al Bashir's guards. The demonstrations on Friday included the states of Khartoum, Port Sudan, Kassala, Sennar, River Nile, El Gezira, White Nile, and West Kordofan. Khartoum has been transformed into military barracks where paramilitaries of the Rapid Support Forces, security and police agents, are deployed all over the city. 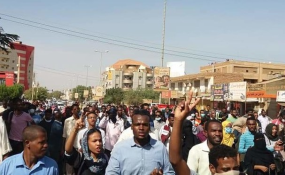 In spite of the military build-up, hundreds of people went to the streets in various districts of Khartoum after Friday prayers to protest against the deteriorating economic situation. Mohamed El Hawar, the imam of Wad Nubawi Mosque, where followers of El Sadig El Mahdi, head of the opposition National Umma Party and chairman of the Sudan Call alliance pray, stressed that "resistance to injustice and tyranny is legitimate and obligatory". He said in his Friday sermon that religion refuses to succumb to oppression, humiliation and submission. He strongly condemned the killing and brutality by the authorities against the demonstrators in the past days, and said that accusing the protesters of treason and mercenaryism is unacceptable. He called for the immediate release of all the detainees and demanded that Al Bashir and his government step down. In a remarkable development, Esam Ahmed, the imam of El Nour Mosque in Kafouri, who is known to be a close associate of the president, joined the critics of the government. In his Friday sermon, he condemned the violent security measures to break-up or prevent the demonstrations. "In misguided situations, justice and truth must be spread, and power must be combined with truth," he said. He called for accountability of officials involved in "stealing the people's food" in the public and private sectors. He warned for further killing and bloodshed. The Salafist imam of El Jereif Mosque in Khartoum, Dr Mohamed Abdelkarim, also attacked the regime and demanded its demise in his sermon on Friday.